Germany is bleak after the stunning defeat at Stalingrad. Private investigator Bernie Gunther is at work in the German War Crimes Bureau – weary, cynical, but well aware of the value of truth in a world where that’s now a rarity. When human remains are found deep in the Katyn Forest, Bernie is sent to investigate. Rumour has it that this mass grave is full of Polish officers, murdered by the Russians. For Josef Goebbels, proof of Russian involvement is sure to destroy the Western Alliance, giving Germany a chance to reverse its devastating losses. But suppose the truth is more damaging to the German cause? It really does go without saying that this is another quite superb novel from the man who can’t put a foot, or a word, wrong. The plot is of course superb, but maybe less obviously so than the incomparable ‘Field Grey’ partly because it is to do a different job. The Katyn massacre was a “they did it!””No, they did it!” tennis ball hit back and forth from the Second World War onwards, until the…well, let’s just say until the fall of the Berlin Wall, shall we? Bernie Gunther’s depression brought on irony, goes into overdrive. He is sent sent to Poland as a representative of the German War Crimes Bureau. He is of course tasked by the German authorities, with investigating a murder, or several murders, in 1943, in Eastern Europe, is another. He is an ex-Policeman, and ex-Private Investigator, used to investigating murders, but usually one at a time. So, now he begins to wonder, how many murders does it take for an investigation? Which murders do we actually want ‘solved’? Who do ‘we’ want taking the blame for the murder that we’re not sure we want to admit happened, until we find the culprit we have decided is guilty? You see? Coupled with his knowledge of what went on in the East in the early days of the invasion of Poland, Ukraine and then Russia, and the smell – it’s a wonder he can remain sane. But, luckily for us, he can. And, of all places to fall in love, he falls in love in Katyn. Another more personal, poignant mirror held up to the tragedy. 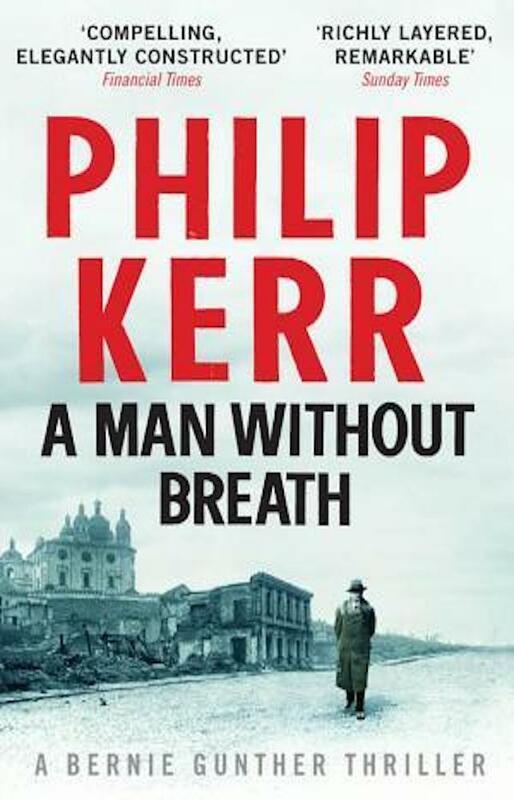 That Philip Kerr constantly puts his Bernie Gunther in situations where he witnesses or even takes part in, some of the low points of the German part in World War II, has troubled me a little. But I’ve come to terms with it. Of course, PK wants to discuss some of these incidents and events. Constantly putting BG there, might risk seeming a trifle contrived. “What a coincidence? !” it might be easy to be cynical and suggest that PK is manipulating us/Bernie/the series, beyond what is likely (to have been real), if – as a writer – he’s still trying to make real, relevant points about what you’re discussing. However, Philip Kerr builds a picture of the Germans, through Bernie, to answer ideas about their post-WWII actions, even where they are today I guess, and look at the question of that having sprung from us wondering how much the average German knew of what was done in their name? How much did the German armed forces – those not privy to the motivations and operations of the SD, SS, etc, – know of what was being done? In the East, the Army went in and pushed onwards and onwards, the SS and Einsatzgruppen and SS followed in afterwards, but much of their actions were known, both to the men further forward and to those back in Germany where of course they returned on leave. So I’ve given up worrying and started thinking. I’m not going to say ‘enjoying’ given the subject matter, maybe appreciating a master of his craft at his best. The Speesh Reads Fact Dept reports: Though the killings took place at several places, the massacre is named after the Katyn Forest, where some of the mass graves were first discovered. Katyn is west of the city of Smolensk and roughly 60 km from the Russian border with Belarus. The number of victims is estimated at about 22,000.